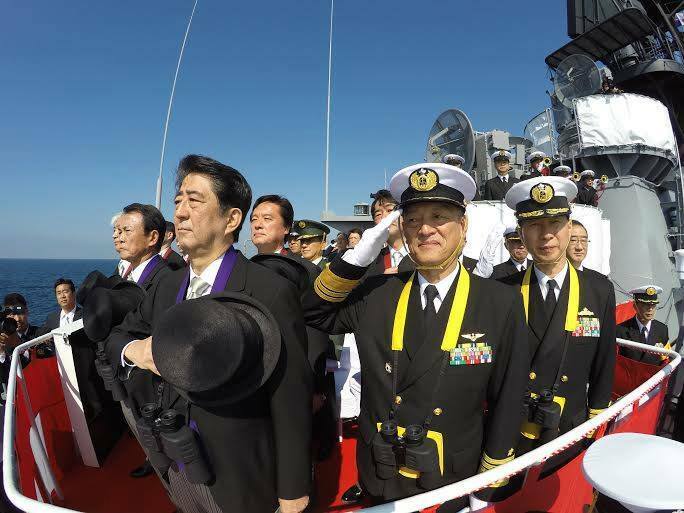 This last week, Japan's JMSDF showcased it's fleet for its tri-annaul review before Prime Minister Shinzo Abe. 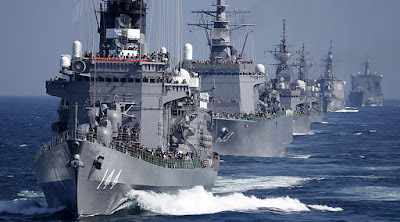 The Fleet conducted its review in Sagami Bay which included its modern armada of missile guided cruisers, destroyers, submarines, aircraft, and the fleet's largest vessel since WWII the new helicopter carrier the Izumo. While smaller than it's IJN predecessor, Japan's JMSDF is powerful capable force that will soon see the addition of the Izumo Class Helicopter carrier KAGA that will meet the growing security challenges in the region. Surrounded by the sea, and living thanks to the sea. Japan is a nation that regards the safety of the seas as its own safety. Today I attended a naval review. I was all the more impressed seeing the valiant figures of our “personnel defending us out on the sea,” whose accuracy and precision are unrivaled in spite of the large waves out in the open sea. The Self-Defense Forces, who single-mindedly continue to defend the peace of Japan while braving the angry seas, overcoming air turbulence, or becoming covered in mud. Those who join the SDF take their own decision to walk down paths where they take up difficult posts. They are the pride of Japan.As the Commander-in-Chief of the SDF, I would like to express my heartfelt gratitude to the families of the SDF members for sending their beloved spouses and children out into the field.